GeoSkrim® J24BDX1 is a unique, single-side textured reinforced gray/black geomembrane manufactured using high strength polyethylene resins. GEOSKRIM® J24BDX1 is designed with a textured gray surface to minimize thermal expansion while providing a cooler working surface. The black layer includes carbon black and thermal stabilizers to assure exposed longevity. Contrasting colors also provide a vital function for ease of damage detection during the installation. GEOSKRIM® J24BDX1 is manufactured utilizing a cast extrusion process to achieve a consistent friction surface with uniform asperity heights and is reinforced with a tri-directional scrim reinforcement to maximize tear and puncture resistance. 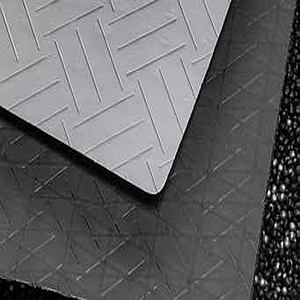 The SurGrip™ textured surface consists of a diagonal cross-hatch pattern with equally raised self-draining treads. GEOSKRIM® J-Series membranes are formulated with thermal and UV stabilizers to assure exceptional longevity. Custom colors are available based on minimum volume requirements.